My baby's been due for a car seat upgrade, since he outgrew his infant car seat. I've been agonizing as to what to buy for a whole month now (no, I did not drive the baby around in a seat that he outgrew). When I first researched convertible car seats, I've literally touched every single one available, and read safety specs and reviews for all the "promising" options. Finally, I narrowed it down to two - The Britax Boulevard and Snugli. I liked the Snugli for it's temperature regulating fabric and the super padded wings on the headrest. I liked the Britax for it's unique safety features, like the safecell technology designed to compress in a crash and Hugs chest pads, but was not crazy about the fabrics. I really could not make up my mind between the two since I really wanted the best of both worlds. Well, sometimes it pays to procrastinate. Britax has rolled out the 2014 G4 car seats, which only became available this week. The Boulevard model is available in a new Laguna (teal) color. This color is a different fabric which seems softer, more breathable and comfortable than the 2013 Britax fabrics. Of course, only time will show if it proves to be so. Other upgrades on the G4 car seats are new, wavy HUGS chest pads. The wavy design prevents the chest clip from sliding down, ensuring proper harness positioning and tightness. Also, color coded labels and a new label indicating maximum shoulder height for rear-facing children was added. 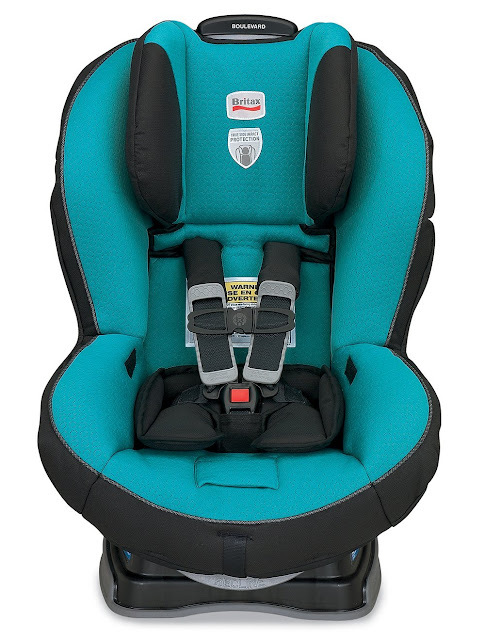 on SALE at Babyage.com for $249. with free shipping and free returns.